Spring 2012 Trend Alert: Hello, PETAL! 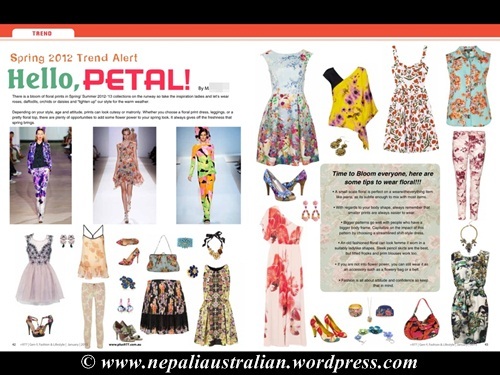 This article was published in +977 (a Nepalese Lifestyle Magazine in Australia) in Jan 2013 issue. There is a bloom of floral prints in Spring/ Summer 2012-‘13 collections on the runway so take the inspiration ladies and let’s wear roses, daffodils, orchids or daisies and “lighten up” our style for the warm weather. Depending on your style, age and attitude, prints can look cutesy or matronly. Whether you choose a floral print dress, leggings, or a pretty floral top, there are plenty of opportunities to add some flower power to your spring look. It always gives off the freshness that spring brings. Time to Bloom everyone, here are some tips to wear floral!!! A small scale floral is perfect on a wear with everything item like jeans, as its subtle enough to mix with most items. With regards to your body shape, always remember that smaller prints are always easier to wear. Bigger patterns go well with people who have a bigger body frame. Capitalize on the impact of this pattern by choosing a streamlined shift-style dress. An old fashioned floral can look femme if worn in a suitably ladylike shapes. Sleek pencil skirts are the best, but fitted frocks and prim blouses work too. If you are not into flower power, you can still wear it as an accessory such as a flowery bag or a belt. Fashion is all about attitude and confidence so keep that in mind. This entry was posted in Fashion, Published and tagged +977, +977 magazine, +977 Nepalese Australian magazine, flower fashion, plus977, spring fashion, summer, summer fashion. Bookmark the permalink.